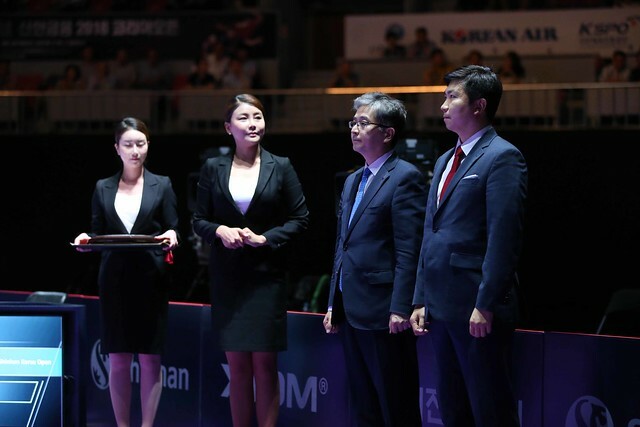 A state of euphoria in the Daejeon Hanbat Stadium, as a result of the Mixed Doubles success by the unified Korean Peninsula duo of Jang Woojin and Cha Hyo Sim; immediately following, on Saturday 21st July, at the Seamaster 2018 ITTF World Tour Platinum Shinhan Korea Open, it was back to business. The Women’s Singles semi-finals and no great shocks, no great upsets, no history making outcomes; the top two seeds, China’s Chen Meng and Zhu Yuling emerged successful. Chen Meng, the top seed, recovered from a two games to nil deficit (9-11, 5-11, 11-9, 11-9, 11-8, 12-10) to beat colleague Liu Shiwen, the no.5 seed and thus asserted the fact that a new name would be added to the Korean Open Women’s Singles roll of honour. Liu Shiwen was the only previous winner to reach the penultimate round; she emerged successful in 2012 when the tournament was staged in the city of Incheon. Success for Chen Meng came immediately after Zhu Yuling, the no.2 seed, had ended the hopes of Japan’s Kasumi Ishikawa, the 4 seed; the runner up last year when beaten by Singapore’s Feng Tianwei and in 2013, when losing by the very narrowest of decisions, to the host nation’s Suh Hyowon. In a most impressive manner, Zhu Yuling won in four straight games (11-8, 11-6, 11-8, 11-9) and thus maintained her ascendancy over her rival from the Land of the Rising Sun. Memorably, in their first ever meeting, Kasumi Ishikawa beat Zhu Yuling in the final of the Girls’ Team event at the 2010 World Junior Championships in snowbound Bratislava, as Japan recorded a memorable three-one victory. Later in the Girls’ Singles final, Zhu Yuling reversed the decision, from that moment onwards, with the exception of the 2013 ITTF Austrian Open in Linz when Kasumi Ishikawa prevailed in their quarter-final Women’s Singles encounter, the decision has always gone the way of Zhu Yuling. Most notably earlier this year at the Team World Cup in London and at the Liebherr 2018 World Team Championships in Halmstad, Zhu Yuling prevailed in straight games; it was the same in Daejeon.